CubeDesktop creates six virtual and independent desktops, increasing the space you have to work and play. It helps users to maximize productivity though the advanced application and desktop management, providing increased efficiency even on a single monitor by enabling multiple desktops. It enables users to quickly access any virtual desktop or window, fast transfer of windows between virtual desktops, thus creating the ideal working enviroment. ...... control over applications, thus creating the ideal working enviroment. 1. Every single desktop may have its own wallpapers, icons and name. Change your Windows wallpaper as usual and arrange your icons using your favourite layout on every single desktop, CubeDesktop just remembers everything when you switch between desktops. 2. CubeDesktop also includes and integrated icon manger allowing you to quick and easily which icons are shown on every desktop. 3. 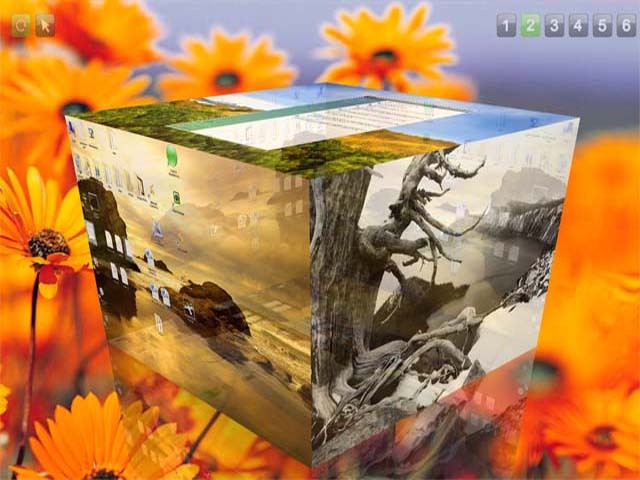 CubeDesktop, being the most robust multiple desktop software, solves the desktop clutter problem once and for all. Each virtual desktop is a distinct working environment. The taskbar shows only the applications opened on the current desktop, greatly reducing the clutter. Qweas is providing links to CubeDesktop 1.4 as a courtesy, and makes no representations regarding CubeDesktop or any other applications or any information related thereto. Any questions, complaints or claims regarding this application CubeDesktop 1.4 must be directed to the appropriate software vendor. You may click the publisher link of CubeDesktop on the top of this page to get more details about the vendor.